Passed away Saturday, November 24, 2018, aged 71. Beloved wife of the late Carl Edwards for 47 years. Devoted mother of Christopher (Anne) of Toronto. Adoring grandmother of Elliot and Evelyn. Loved daughter of Marion Park of Cannington. 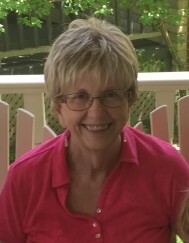 Sister of Jim (Carol) and Cathy (Ken). Daughter-in-law of the late George and Evelyn Edwards of Sunderland. Sister-in-law of Barry (Barb), Eldene and Ralph (Marsha). Joan will be deeply missed by her nieces and nephews, other relatives, friends, colleagues and students. The family will receive friends at LAKELAND FUNERAL AND CREMATION CENTRE, 19 Moose Road, Lindsay, on Friday, November 30 from 6:00 P.M. to 8:00 P.M., and on Saturday, December 1 from 11:00 A.M. until the time of Memorial Service in the chapel at 1:00 P.M. Reception to follow. If desired, donations to the SickKids Foundation or The Dragon Flies (cheque only) would be appreciated. Online condolences may be made at www.lakelandfuneralcentre.com.